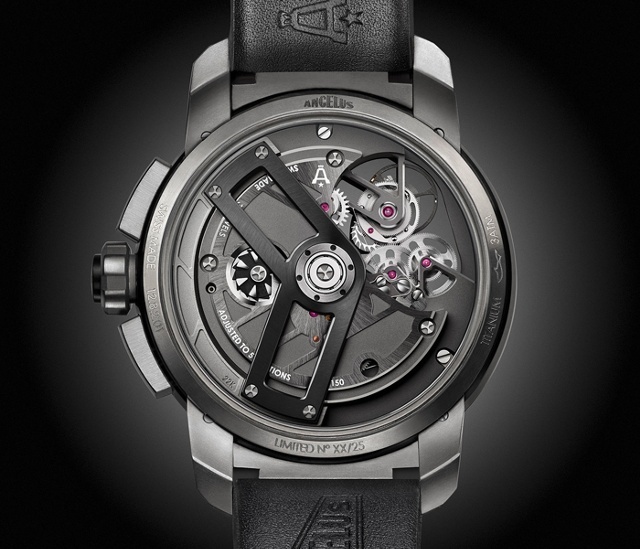 One of the latest Baselworld debuts, the Angelus U30 Tourbillon Rattrapante harnesses a one-minute tourbillon, a split-seconds column-wheel chronograph and a flyback. The timepiece joins the ranks of Angelus’ historically groundbreaking chronographs including the Chronodato, released in 1942 and possibly the first serially manufactured chronograph with a calendar. So when it came to developing an entirely new chronograph movement, Angelus’ chief technical director Sébastien Chaulmontet and his staff knew they had to devise a movement that continued the rich history of the recently re-started Swiss watch company. Pairing a column-wheel chronograph and flyback requires the inherent forces at work to be expertly managed to ensure seamless operation. Smoothness is assured with the use of two column wheels, one dial side for the split second chronograph and the other to the rear for the flyback function. A split-second chronograph pushpiece is integrated into the crown, obviating the need for an additional pushpiece and according the watch with a clean appearance. This aesthetic detail provides a foretaste of the design prowess further revealed beneath the box sapphire crystals. The automatic movement is visible from the dial side as an exhibition caseback. A total of 15 wheels can be seen dial side alone. The U30 Tourbillon Rattrapante eschews a conventional dial, displaying information on the various movement bridges, including an asymmetrically positioned power-reserve indicator. Angelus notes that horology fans will likely appreciate the visible column wheel for the split-seconds function at 4 o’clock, positioned just below the 30-minute counter. The observer can even watch it in operation when the split-seconds function is activated. 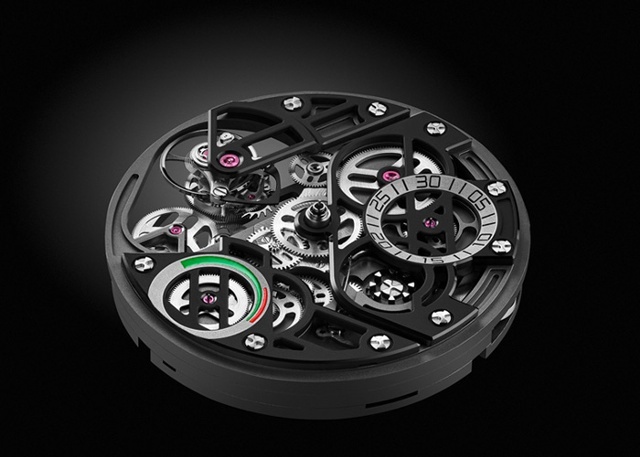 Each of the U30 Tourbillon Rattrapante functions are fully integrated, rather than modular add-ons. They are built on several layers, each visible thanks to skeletonized bridges creating an A-shape (a nod to Angelus). To further increase the impression of depth, the movement is fully transparent around the tourbillon and treated in various shades of black and grey. 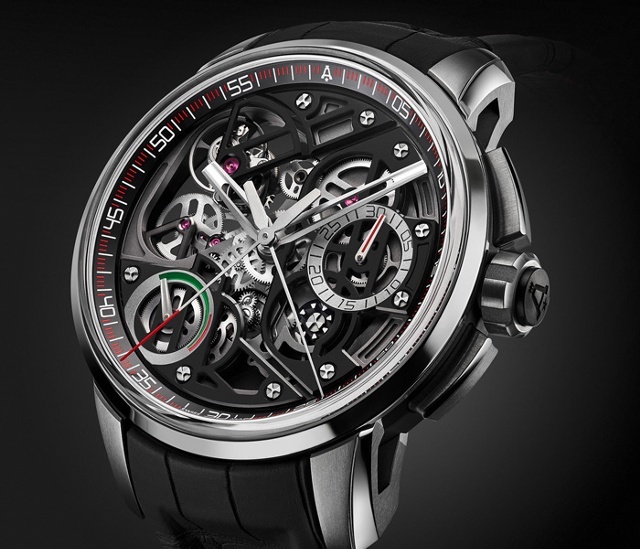 The power reserve indicator is positioned at 8 o’clock and is integrated onto the skeletonized bridge with a green sector indicating ideal torque, while red highlights that it’s time to wind the watch. Find out more about Angelus here.